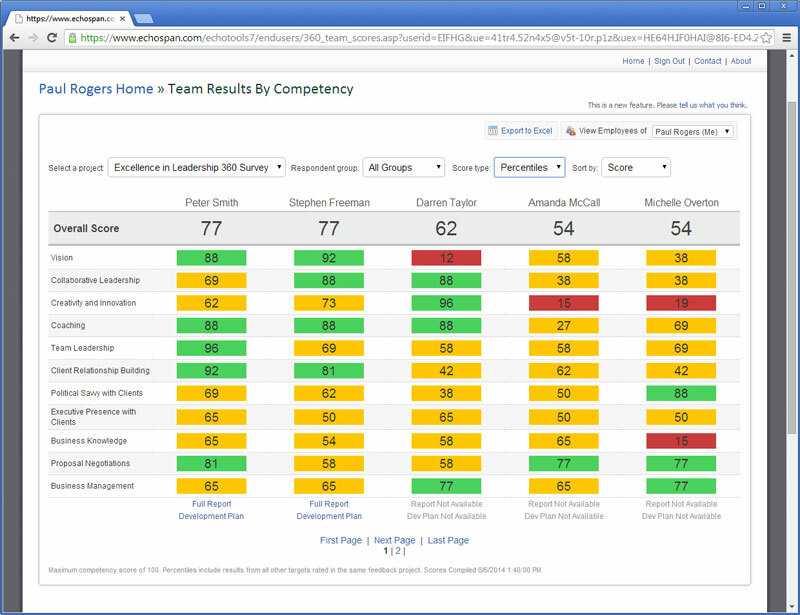 The Team Summary Dashboard provides Managers easy, online access to 360-degree feedback scores for their teams. This feature is available in the Enterprise Edition of EchoSpan's 360-degree feedback tool. 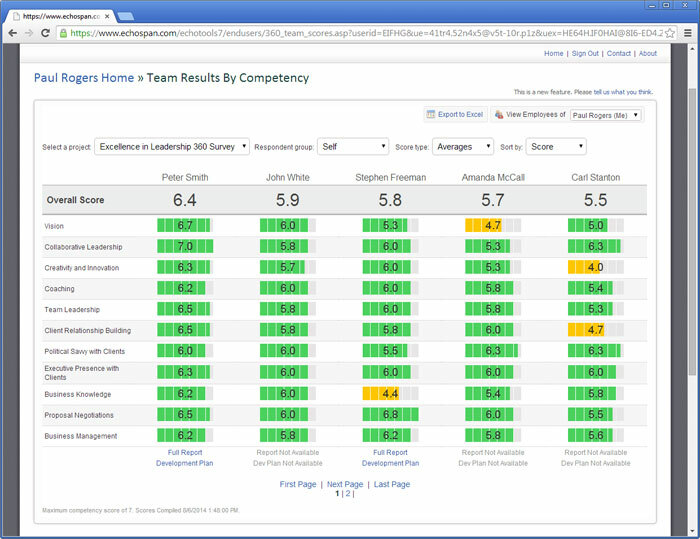 Easily view and compare scores between team members on-screen. Color-coded score ranges make it easy to see who is performing well and who potentially needs assistance. Instant access to comparative scores including competency averages, percentiles and quartiles. 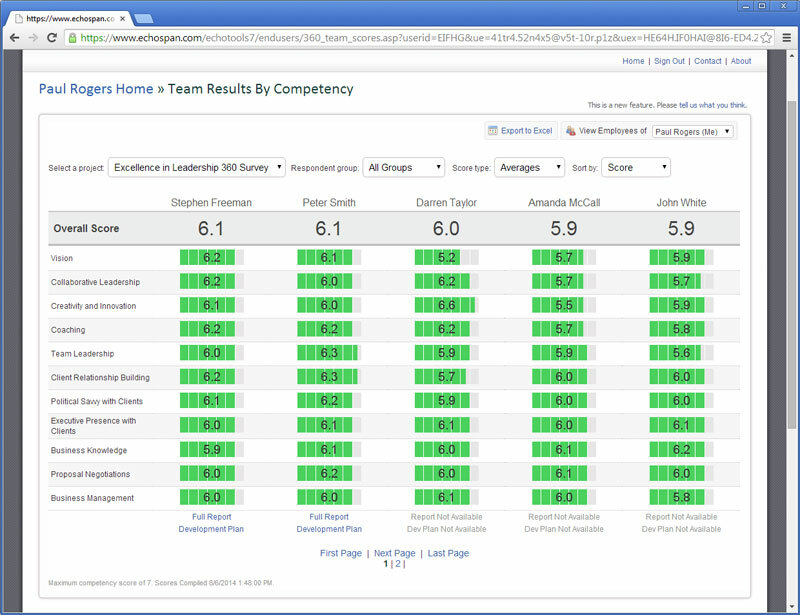 Ability to download full 360-degree feedback reports for every team member. Visibility into the scores for teams reporting to all lower-level managers within a specified Manager's span of control. Direct access to development plans for each team member. Modifiable, sort-able views based on project, Rater type or score type. One-click export of scores for an entire team to Excel. Access permissions to the Team Summary Dashboard are set up in the administrative tool. In order to display scores to managers for a particular project, you must first compile the results for that project. The compilation process computes competency averages, quartiles and percentiles for all targets in a given project and freezes them at that point in time. In order for this feature to work, you'll need to have your employee database and reporting structure uploaded to EchoSpan. Please contact your client manager for assistance with this. Open a 360-degree feedback project. Turn the "Team Summary Dashboard" setting ON. Configure the "Team Summary Dashboard Extended Team View" option as desired. Note that if these options are not visible on your Advanced Settings page, you are either not subscribed to the Enterprise Edition of EchoSpan, or, your project's application code needs an upgrade. To upgrade your project's application code, please submit a support request to support@echospan.com. From the drop-down menu, select Project >> Phases. On the Project Phases page, turn the Feedback Phase OFF. You will see a pop-up alert message indicating that scores are being compiled. Scores will be compiled automatically within a few minutes. You will be notified via email when the compilation process is complete. 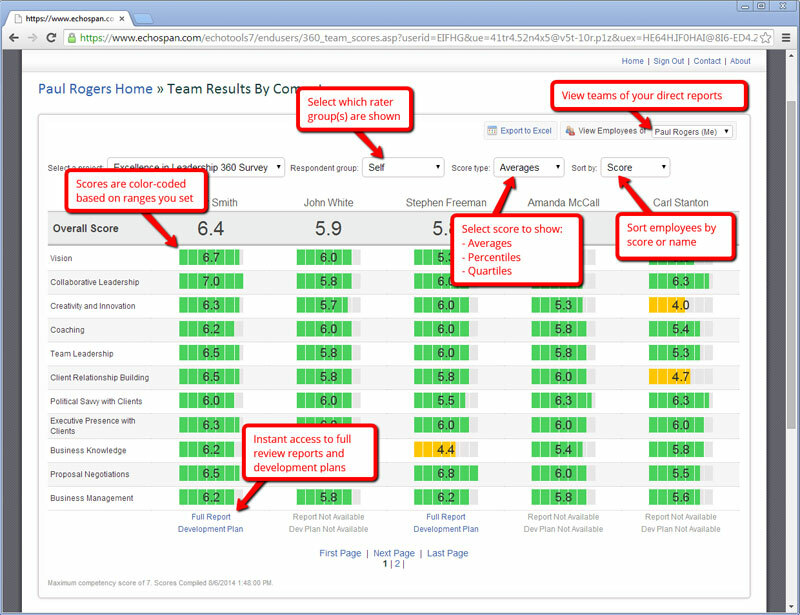 Then, Managers can log into the EchoSpan tool and view results for their teams. 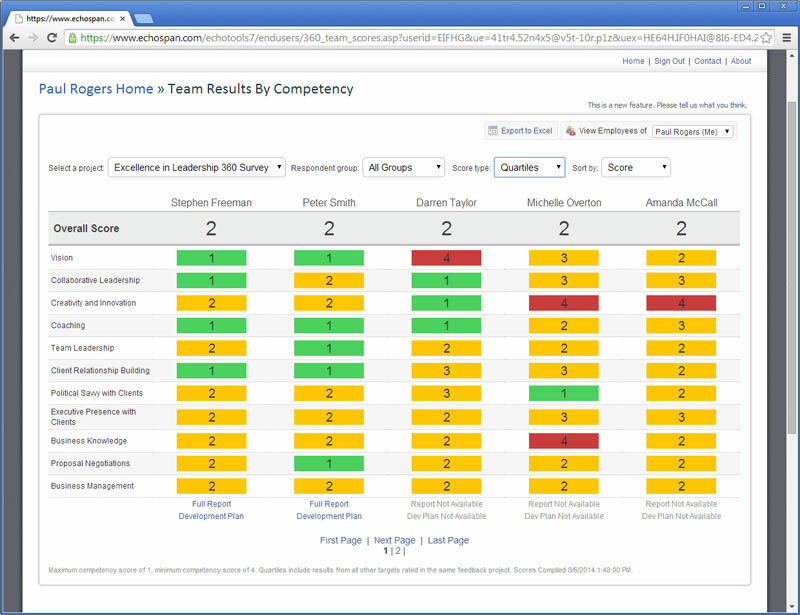 After clicking the link above, the Manager is taken to the Team Summary Dashboard where results for the current project are displayed instantly (shown below). From this screen, Managers can use the tools on the page to modify his view of team results or create an export of the data. If you have any questions about activating this feature for your projects, please contact us at support@echospan.com.